Opencart Marketplace Recurring Profile : Marketplace Recurring Profile is a Marketplace Add-on for Opencart. It allows the sellers to set up the recurring profiles for their customers. The sellers can use recurring profile for products which need payments at regular intervals. 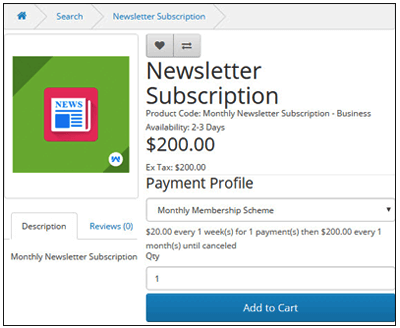 Recurring profiles are useful for subscription and membership type of products. It can also be used for setting up the installment payment schemes. The recurring payments are available for daily, weekly, monthly, semi- monthly or yearly. The seller can create a recurring profile for their products from the front-end. 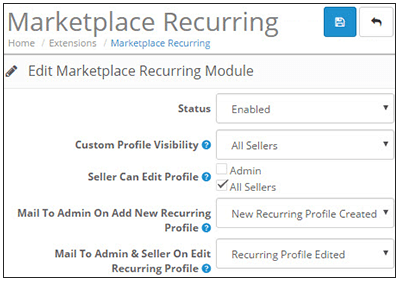 Sellers can use recurring profile of other sellers and the admin. 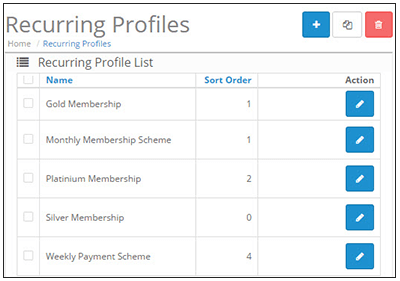 Multiple recurring profiles can be assigned to a product. Trial Profile option is also available. The admin can select recurring profile visibility for the sellers. Notify seller, when another seller edits its recurring profile. Notify admin, when a seller add/edit a recurring profile. View recurring profiles of other sellers and the admin. Recurring payments interval – daily, weekly, monthly, semi-monthly or yearly. The user can view details about the recurring profiles available. Enable or Disable the module status. Set recurring profile visibility for sellers. Allow sellers to edit recurring profiles. Select mail templates for new/edit recurring profile. Set the name for the recurring profile. 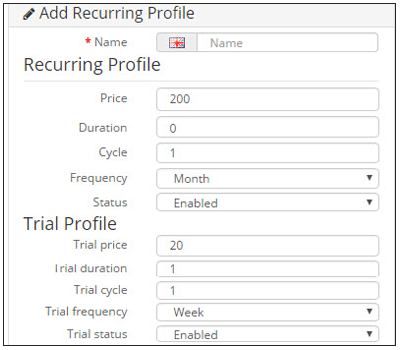 Set recurring profile - price, duration, cycle, frequency. Recurring profile status as Enabled or Disabled. Sort the order of the recurring profile. Trial profile status as Enable or Disable. Set trial profile - price, duration, cycle, frequency. The admin can manage all the recurring profiles of the marketplace. It can even allow the sellers to view and edit recurring profile of other seller & admin. The admin can add, edit or delete any recurring profile. The sellers can view the recurring profile name, status, seller name, sort order. A seller can't delete recurring profiles of other sellers & admin. Add or remove a recurring profile. Select recurring profile from the list. 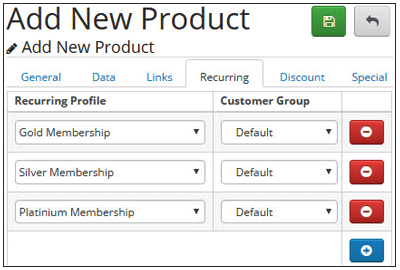 Select the customer group for each recurring profile. On the front-end, the users will see the Payment Profile option. The users can select any of the available recurring payment options from the menu. Payment details about the selected recurring profile is visible. Trial profile payment details is also available for the users. The users can enter the product quantity and do the checkout. Did you buy Opencart Marketplace Recurring Profile?